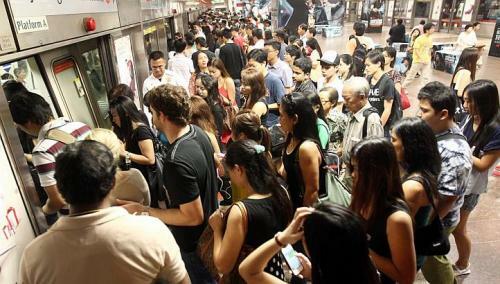 To reduce morning rush in suburban trains towards downtown, Singapore Land Transport Authority or LTA has introduced free train journeys with a few riders in Singapore's metro or MRT as a trial that would last for one complete year. Looks funny isn't it? But it is not. Official announcement says: “ From 24 June 2013, free travel on the rail network would be available for commuters who end their journey before 7.45am on weekdays at 16 designated MRT stations in the city area. In addition, commuters who exit at these stations between 7.45am and 8am will be given a discount of up to 50 cents off their train fare.” Naturally, The Government of Singapore will be funding this one-year trial. The objective of this trial, which looks self defeating Prima facie, is to encourage commuters who are able and willing to make changes to their travel schedule and can travel earlier into the city area before the peak hour. 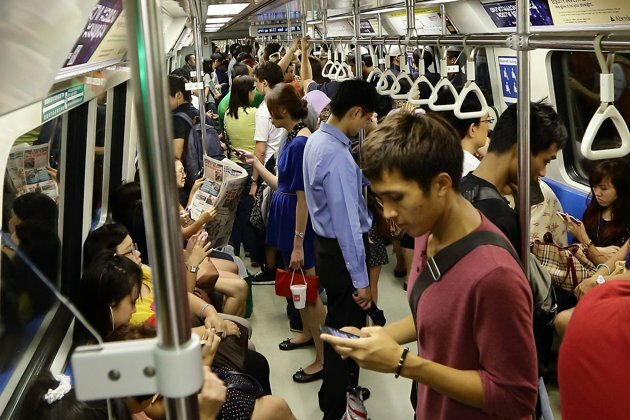 This would help spread out the morning peak hour crowds to the pre-peak period, and ease the crowding situation on city-bound stretches of the MRT network. Many commuters are likely to be happy. Singapore MRT travel is not exactly cheap. A ride to the city from suburban areas could easily cost between USD 1 and 2. For people, who need to travel every day, the cost works out to be noticeable. The measure might succeed or might not succeed, which we can know only after one year, but the point that is perhaps missed here is the real cost of this new trial, borne by the Government, and which is likely to be around SG$ 10 Millions. This money has to come from either diverting some other expenditure or by increasing Government income or taxes. Either way, final pay out is made by the people themselves only. The commuters may feel elated now, but these free rides are bound to hit them in same way or other. In India, some of the Petroleum products like Kerosene, Diesel and LP Gas are subsidized very heavily. India's finance minister, in his annual budget last year, proposed that each consumer shall be given only 6 LPG cylinders with a subsidized price. Any further quantity would be available at market prices. There was a huge hue and cry from the people because they were now expected to pay out a substantial extra cash for the LPG cylinders. 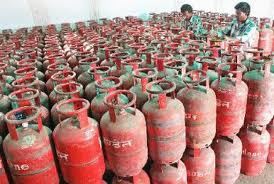 After much consideration, the limit of subsidized cylinders have been fixed at 9 per consumer. At these subsidized prices, oil companies loose Millions of Rupees on sale. Government therefore gives the oil companies compensation in some form or other. Now, where from this compensation money come from? This again is the same story. This money either has to come either from diverting some other expenditure or increasing taxes. In India, both these options are tough for the Government because of political pressures. So Government follows the easiest way; it prints more money. Unfortunately, this money does not grow on trees. In India, there are hundreds of things that are subsidized, in this fashion. The net effect; any economist would tell you; is high rates of inflation and weakening of Rupee. Inflation kills the common man, because all goods and services that are available to him cost more and the cost of living keeps increasing all the time. Economists naturally, are very much aware of this cascading effect of giving subsidy and keep advising against it to the Government, which unfortunately finds itself unable to take any effective measures. This is the main pitfall in giving subsidies, which can be a very populist measure by the Government. Finally,real brunt of these subsidies is again borne by people of low or fixed incomes only, who in the first place, are expected to be benefited by the subsidies, because income levels for others, normally keep increasing with the inflation. I have always thought that giving subsidies is a kind of a deception. In India at least, there seems to be no way out as no Government can withdraw subsidies because of political pressures. We therefore appear to be surely headed to a rather gloomy economic future. Cost of free stuff is indeed very high. Anything in India is difficult. Limited resources, heavy demand. Too many poor people. Too many, more than total of several other countries' total population. somebody's always getting hurt, no matter what you do. If you tax rich people too much, they will stop producing wealth, which is bad. Even if you tax poor people, and assuming they pay honestly, the total revenue will be very very small. SO where do you bring money from? U.S. simply keeps increasing debt, 17 trillion dollars and growing . Is that the right way? Of course not. Growing population, excessive greed, selfishness, increasing tendencies to avoid work, expect entitlements are the curse of the whole wide world. A sign of better culture, civilization is supposed to be compassion for poor, disabled. We created Governments to protect our poor. If we let that go, then we will be like jungle animals. The only difference is that the weak have no choice to strive to be strong enough to survive. The species, individuals who managed that, survived. Are we heading towards that Jungle situation? Would it be really bad if that happens? Deep philosophical and pragmatic thinking is required. A discussion would be good.